Madurai Rameshwaram Kanyakumari tour package includes the most venerated pilgrimage cities of India. Apart from being the most esteemed holy cities of India, Madurai Rameshwaram Kanyakumari boast of meticulously carved, spectacular temples, displaying brilliant workmanship. The Meenakshi temple of Madurai deserves special mention for being an architectural marvel. It has made its entry into the top 30 nominees for the new Seven Wonders of the World. No wonder then that South India Temple Tour cannot be complete without a visit to Madurai’s Meenakshi Amman Temple. The Madurai Rameshwaram Kanyakumari tour is a wholesome travel package for pilgrims and vacationers alike. It includes the sun soaked pristine beaches, rich flora and lush greenery, architectural marvels like the bridges, museums that reflects the culture and rich heritage of India, meticulously carved holy shrines of India and a radiant sunset against the epic Kanyakumari temple. Madurai Rameshwaram Kanyakumari tour begins from Madurai as we pick you from the Madurai airport or railway station and transfer to the hotel booked at Madurai.Popularly known as the city of nectar,it is the largest cultivator and exporter of Jasmine flowers. On arrival, check in at the booked hotel and relax. Later, join us for the tour of the fascinating Meenakshi Amman temple.The Madurai Rameshwaram Kanyakumari tour package includes the visit to one of the most awe-evoking temples that is the temple of the triple breasted warrior goddess Meenakshi. Every evening around 9 pm, incense enshrouded, frenzied procession carries the idol of Lord Shiva or Sundareswarar to the Meenakshi Temple’s shrine and visitors are welcomed inside. The best time to visit the temple is in the month of April, when the Meenakshi Tirukalayanam festival is held to celebrate the wedding of Meenakshi Amman to Lord Shiva.The temple houses the Art Museum in a thousand pillared hall located on the right side of the entrance. After having the breakfast, join us for sight-seeing of Madurai, popularly known as the Athens of the East because of its antiquity and historical importance. The word Madurai is derived from the word Madhura or sweetness, and is popularly believed that this nectar is showered from the matted hair of Lord Shiva. Where to eat in Madurai ? What to buy in Madurai ? Must visit places in Madurai ? Best Places to Eat in Madurai: If you are interested in tasting authentic Tamil cuisine, Sree Saberess (56A, West Perumal Maistry Street, Town Hall Road, 91 452 437 9037, INR 150 cost for two) is the restaurant, which offers scrumptious Tamil food; Phil’s Bistro (444 East 9th Street, K.K.Nagar, 91 452 258 3444), is an American and Italian restaurant; Murugan Idli Shop (No 196, Near Pothys & Jos Alukas, West Masi Street, Madurai 625001, 2341379, INR 200) offers South Indian cuisine; Chopstix Multicuisine Restaurant (KK. Nagar Branch: 144 Arch Road, AR, 919600034599, INR 800 for two) that offers delicious Chinese, Indian, Asian and Continental food. Best Things To Buy In Madurai: The Madurai Rameshwaram Kanyakumari tour package offers a superb shopping opportunity during leisure time. What to Buy: Explore the hand-woven silk, cotton fabrics, batik textiles, bronze images, wood carvings, bell-metal lamps, and stone carvings. These are some of the best things to buy in Madurai. Where to Buy: South Avani Moola, East Masi Street, and Town Hall Road are the popular shopping areas of Madurai. To purchase handloom textiles or cotton, visit Puthumandapam. To buy handicrafts, Government Poompuhar Handicrafts Shop (West Veli Street), Khadi Gramayog Bhavan (Town Hall Road) and Cottage Arts Emporium (North Chithirai Street) are the best places in Madurai. To buy sarees and fabric, Kumaran Silks (Vengala Kadai Street), Alankar Textiles-Sungudi Sarees (South Avani Moola) are some important shops. 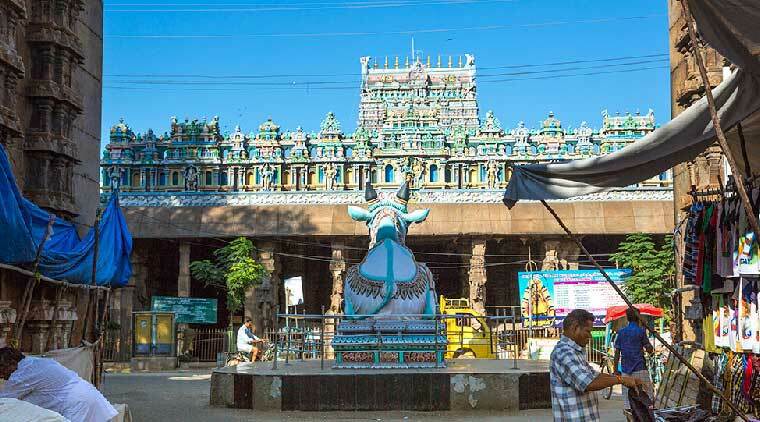 Must Visit Places in Madurai City and Around: Apart from the architectural marvel of the Meenakshi temple, the other places of interest of this city are the Thirumalai Nayakkar Palace, Thirupparankundram Temple, Alagar Koil, Koodal Alagar Temple, Vandiyur Mariammam Theppakulam and Gandhi Museum. The Thirumalai Nayakkar Palace is a brilliant fusion the Rajput and the Dravidian style. The palace is open for the visitors from 9 am to 5 pm and the price for the entry ticket is INR 10 per person. A brilliant light and show detailing the life and rule of King Nayakkar is held within the premises of this temple. Do not miss this show, which takes place between 9 am to 12 pm and 1 pm to 4 pm and is a sure feast for the eyes. After the breakfast, check out from your hotel and then drive to Rameshwaram. Upon arrival, check-in into the hotel at Rameshwaram. After freshening up, join us for sightseeing of this holy city, which is considered as one of the char Dhams, abodes or seats (Pilgrimage sites).The other three holy places that complete the Char (Four) Dhams are Badrinath,Puri and Dwarka. Please carefully go through our must know tips on how to perform Pooja at Rameshwram Temple below. Stage 1 : Darshan of Sphatic Lingam also known as Mani Darshanam : Timings 05:00 am – 06:00 am. Stage 2 : Samudra Snanam : After the darshan of Spatic Lingam, proceed to the sea about 300 mtrs away from temple where the water is very shallow and take your bath. Stage 3 : Teerth Snanam : Take bath at the 22 wells inside the main temple. Stage 4 : Main Pooja : Now perform the main pooja at the temple with the help of local priests. Rama Setu Bridge: The ride to this bridge is enjoyable and a private car can be booked for it for INR 2500 and the mini bus charges are INR 150 per person. The Annai Indira Gandhi Road Bridge is an architectural marvel. It is the first sea bridge of Rameshwaram and offers breath-taking views. Agnitheertham: This is a popular tirtha or pilgrimage spot of Rameshwaram. This beach lies east to the Ramanathaswamy Temple. This pilgrimage spot is visited for a holy bath. It is a popular belief that the childless couples, who bathe in the holy waters and offer prayer to Lord Shiva are blessed with children. The full moon and new moon days are considered to be the most sacred days for bathing. The ritual is to bathe in the holy waters here and 22 sacred wells before offering prayer to Lord Shiva. The Dhanushkodi Beach : This is a deserted beach offering splendid views of sunrise and sunset. The mystical charm, enrapturing sunsets and the picturesque beauty of the place would leave you mesmerized. Enjoy the overnight stay at the hotel in Rameshwaram. Best Places to Eat in Rameshwaram: Ahaan(NH-49, Madurai Rameshwaram Highway, Rameshwaram 623526, 914573223222, INR 400-800) is an excellent vegetarian restaurant offering Asian, Indian and Chinese food and is located in the Daivik Hotel of Rameshwaram); Shabari Restaurant (20/47-A, Sangumal, Jiwan Residency, Olaikuda Road, Near Agni Teertham, Rameshwaram 623526, (91) 04573222207, INR 600) offers excellent Chinese and Indian vegetarian food. Best Things to Buy in Rameshwaram: Aesthetic palm leaf baskets are sold for INR 200, inside the temple shopping area. Near the temple area shops also sell brass and copper ware. The street from the beach (Agni Theertham) to the Ramanatha Swamy Temple are laced with shops selling shell products like mirrors, key chains, earrings, necklace and so on. Kala Seashell Mart (240 East Street, Rameswaram – 623526, 096002 60696) in Rameshwaram is the largest seller of sea shells ranging from all kinds of products such as curtains, jhummers, watches, shell lamps etc. The shop is open from 5 am-8 pm. After breakfast and checking out of the hotel, drive to Kanyakumari and on arrival check into the hotel at Kanyakumari. Join us for sightseeing in the afternoon, which includes temples, memorials palaces and so on. Best Places to Visit in Kanyakumari: Devi Kanyakumari Temple, Suchithram Temple, Bhagavathy Amman Temple, Adi Keshava Perumal Temple, Vivekananda Rock Memorial, Vattakottai Fort, Mathur Aqueduct, Padnamabhapuram Palace, Triveni Sangam, Thirparappu Falls, Our Lady of Ransom Church, Kanyakumari Beach, Gandhi Memorial and Thiruvalluvar Statue are the things to see here. 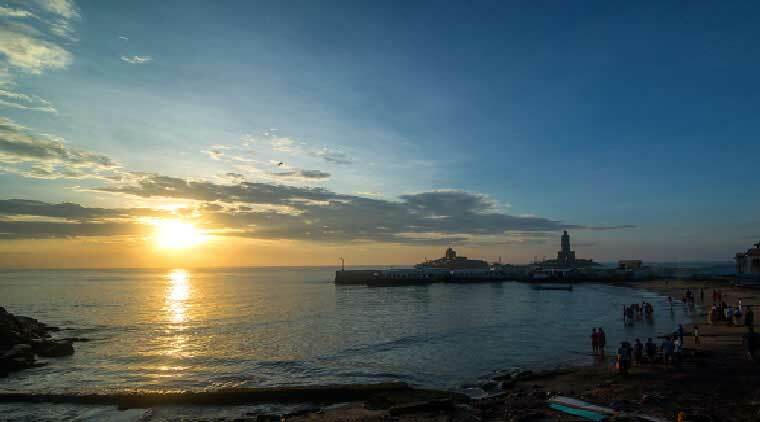 During the evening watch the most beautiful sunset of Kanyakumari. Enjoy the overnight stay at the hotel in Kanyakumari. Best Places to Eat in Kanyakumari: The Ocean Restaurant(2/12, E Car St, Kanyakumari, Tamil Nadu 629702, 04652 246 704, INR 400) offers superb vegetarian Chinese, Indian and seafood; Udupi International Restaurant (Highway Road Side, Thenkarai Kumaracoil Junction, Kanyakumari, India, Kanyakumari, 914652272036, INR 70) offering excellent South Indian cuisines; The Curry Restaurant (East Car Street, Kanyakumari 629702, (91) 4652246355, INR 400 Cost for two) is a multi-cuisine restaurant offering, Thai, Chinese, Japanese, Mexican, North Indian and South Indian cuisines; Le Arabia Restaurant (Opp. to Sri Devi Lodge, Kanyakumari 629072, 918012377537, INR 500) offers delectable sea food. 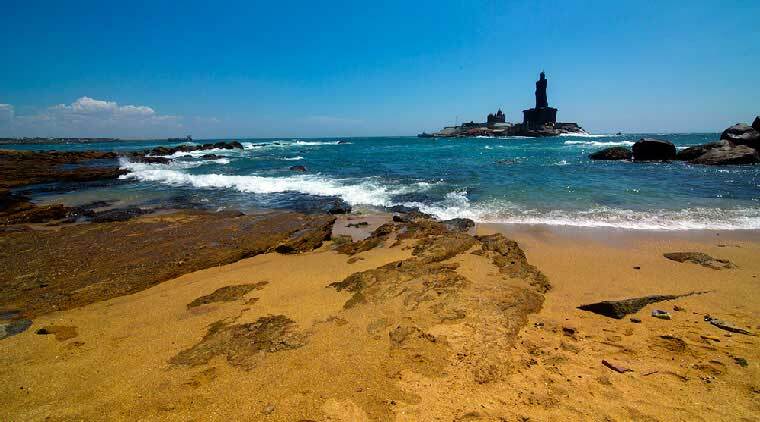 Best Things to Buy in Kanyakumari: This holy city offers various seashell items like souvenirs and trinkets and there are shops that sell decorative items such as cane, wood bamboo and so on. Exquisite palm leaf paintings, dress materials, traditional saris can be purchased from the local shops. A speciality of this place is the marvellous, multi coloured curios made of sea sands and shells. Visit the Tamil Nadu Crafts and Poompuhar and Tamilnadu Co-optex Sales Emporium for handicraft items. After checking out from the hotel at Kanyakumari, drive to Trivandrum. On the way pay visit to the Sri Padmanabhapuram Palace, and Padmanabhaswamy Temple in Trivandrum which is among the richest temples in the world. In the evening, you will be dropped to the airport/railway station. Your Madurai Rameshwaram Kanyakumari tour comes to an end with the drop off to the Trivandrum Airport/Railway Station. 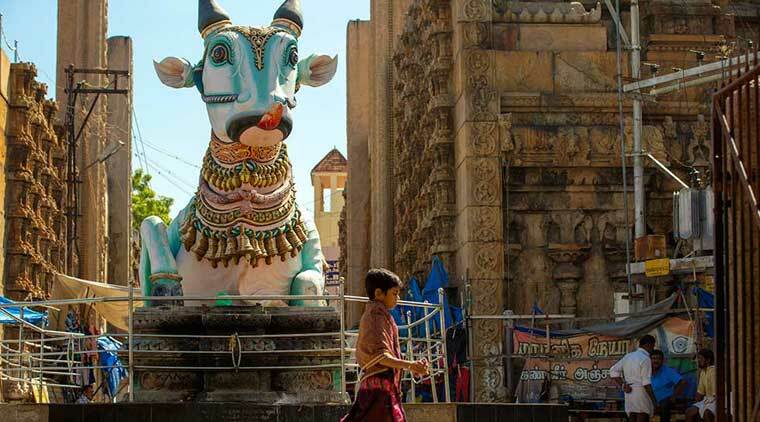 We at Waytoindia.com specialize in Rameshwaram Packages and offer the best selected hotels and immaculate transport by Maruti Swift/Innova Cars/Tempo Travellers/Air Conditioned Buses to the pilgrims who wish to book their Rameshwaram Package. Just send us an enquiry on info@waytoindia.com or call us on 8527255991 and we would take care of your Rameshwaram package. Weather: Summers (March-June) are extremely hot at Madurai and hot and humid at Rameshwaram and Kanyakumari. Monsoons (July-August, may get extended to October) brings down the temperature, but humidity remains intact. Winters (October-February) experience pleasant weather. Best Time: October-February is the best time, though Madurai Rameshwaram Kanyakumari tour package is a year-round option. Meenakshi Amman Temple of Madurai is thousands of years old and commemorates the wedding of Goddess Meenakshi (Parvati) with Lord Sundareswar (Shiva). The main temple of Rameshwaram, Ramanathaswamy Temple, is the place where Lord Rama worshipped Lord Shiva after killing the demon king Ravana. It is one among the four most important Hindu pilgrimage destinations covered in Char Dham Yatra and also a Jyotirlinga. 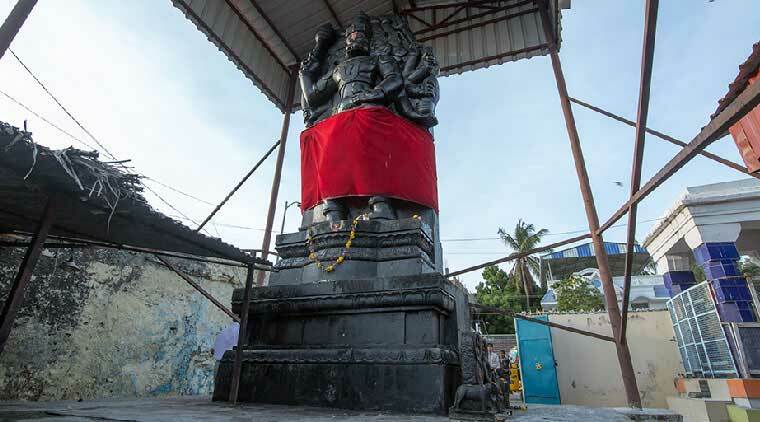 Kanyakumari’s Bhagavathy Amman Temple is believed to be 3,000 years old. It was here that Goddess Bhagavathy incarnated as Kumari Kanya (virgin girl) to slay the demon Banasura. It is one of the 108 Shakti Peethas dedicated to Goddess Shakti. It is located at the confluence of Indian Ocean, Bay of Bengal and Arabian Sea. Hindu pilgrims are allowed inside the main temples of Madurai Rameshwaram Kanyakumari tour package. Foreigners and non-Hindus can access just the outer areas and not the inner sanctum sanctorum. Strict dress codes must be followed by the devotees who also need to take bath before entering the temples. 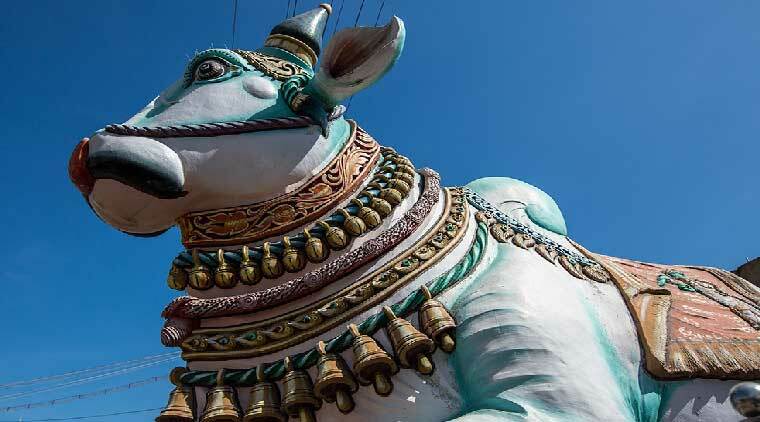 Apart from footwear and socks, other items prohibited inside many temples of the itinerary include caps, cameras, mobile phones with cameras (banned recently in February 2018), umbrellas and items made of animal skin. Smoking, tobacco, paan (betel leaves) too are prohibited. Visitors with certain kind of injuries and women in their menstruation period are not allowed entry. Foreigners need to pay INR 50 per head to access the art and architecture of Meenakshi Amman Temple. Non-Hindus may be a part of the night-time procession at Meenakshi Temple when Lord Shiva’s idol is taken to the shrine of Goddess Meenakshi in a palanquin. Spatika Lingam darshan (cost between INR 10-100) at Rameshwaram Temple is possible between 05:00 a.m. and 06:00 a.m. (though, you must reach there by 04:00 a.m. to be in front). After that, you must take bath (cost between INR 25-75) in the holy sea and 22 teerthams (holy water tanks) before the darshan of Jyotirlinga. Local buses have boards written only in Tamil. Take help from a local resident before boarding a bus. Carry mosquito repellents during Madurai Rameshwaram Kanyakumari tour package, especially to Rameshwaram where hotels are quite close to the seashore.